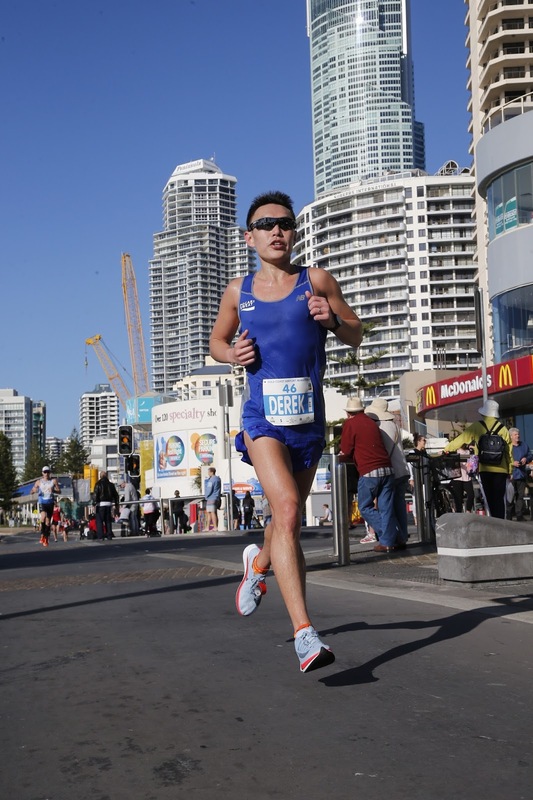 For people who haven't read it, my original race report for the Gold Coast Marathon 2013 was posted as a Facebook note here. This year, I was originally scheduled to race Dubai in January, and then have a stab at a PB by racing at Berlin again in September. 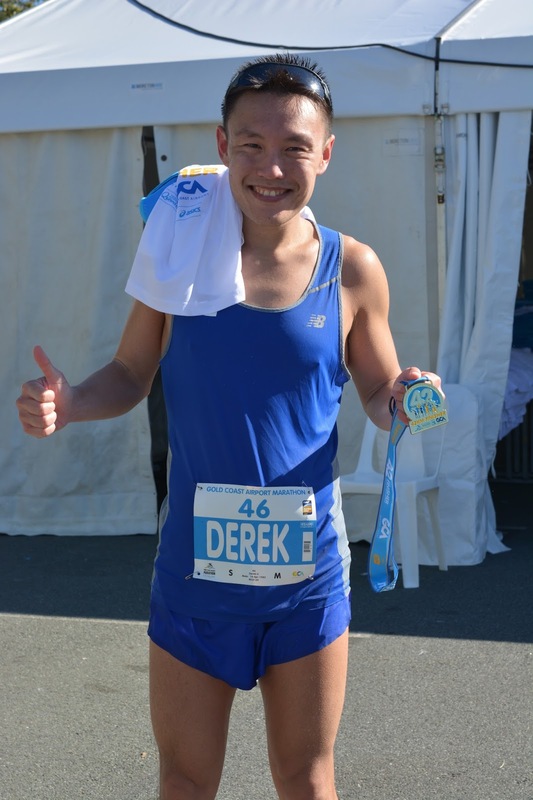 See here for my 2014 Berlin Marathon race report. However, we found out my wife was pregnant with a due date in the third weekend of September, and so we settled on doing the Gold Coast Marathon instead, it gave me a good 4-5 months of preparation and it was pretty much as late as my wife could travel on the plane in July. 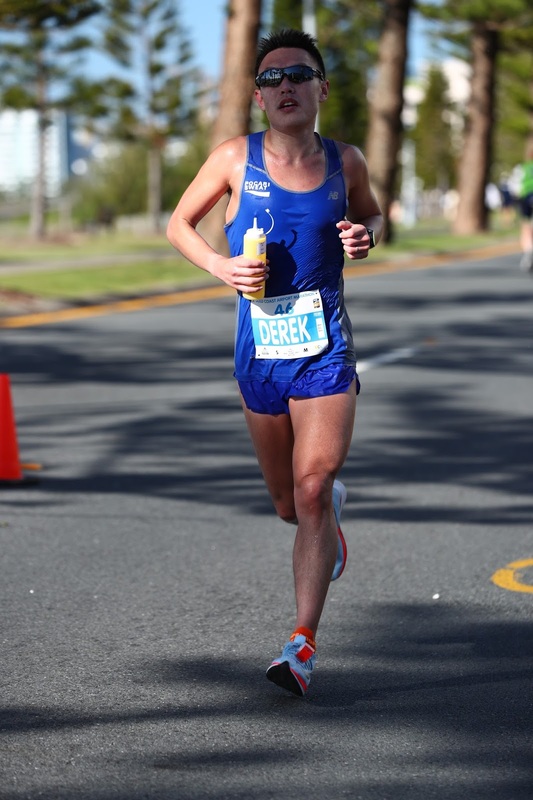 Having done the Gold Coast race before, I sort of knew what to expect of the course. The main challenge of this course was the camber and slight rolling terrain for the first 30km, followed by 2 short hills, with the remaining 10km being relatively flat and straightforward. 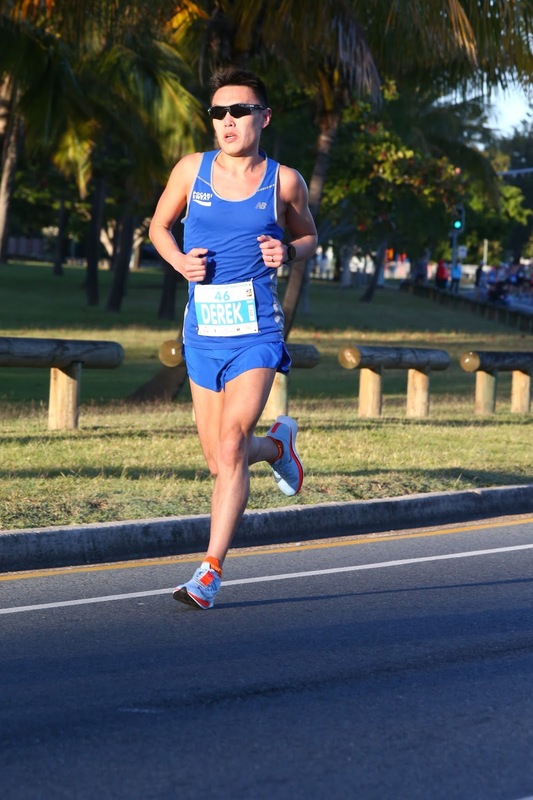 My preparation for this race was different than before in the sense that for the first time in a while, I was finally getting in a long sustained block of uninterrupted training without any niggling injuries, and I finally got myself a coach to write my training plans. I had never had a coach before and for the longest time I kept putting it off because I was worried I would not be able to hit the prescribed paces, because I struggle so much with singapore heat that I am consistently running 20-30s/km slower in Singapore than in ideal cold conditions. In the end I figured I wasn't getting any younger and it was worth getting a fresh set of eyes, since I had managed a PB in 3 years. I won't bore you with the details of how I found a coach, but let's just assume that for someone like me who weighs his shoe laces to choose the lightest pair for racing, it was a meticulous process. The tough part was realizing I had to look overseas for a coach, since there were very few local coaches who focused on marathoners, and even fewer whom I think would have agreed to coach me. All the runs are on Strava so it's not like I privatize any of my training. Long story short, I managed to get in a solid 16 weeks of consistent and progressive training, and the big thing we did was focus more on speed development, which i had never done before. I still think there's room for improvement there and we will probably continue to work on that. For reference, my 5km PB remains at 17:58, when my marathon time translates to 16-high. Go figure. The overall weekly mileage for these 16 weeks was actually the lowest I had ever done in a hold up to any marathon; I think it was around 125-130km on average. For reference, I averaged about 140km for the build up to my very first marathon, and at least 150km for all the subsequent ones. It was quite difficult for me mentally, to do so little mileage and I worried a little about the endurance base, but that's the whole point about having a coach I guess. You follow the plan without questions, and leave the thinking to the coach. If there's no 100% buy-in with a coach, then things become very difficult and you should probably find some other coach. I made sure I stuck to the prescribed paces as much as I could, and didn't go harder than the prescribed paces on the workouts I could have, although truth be told, hitting the prescribed times was usually very hard already. 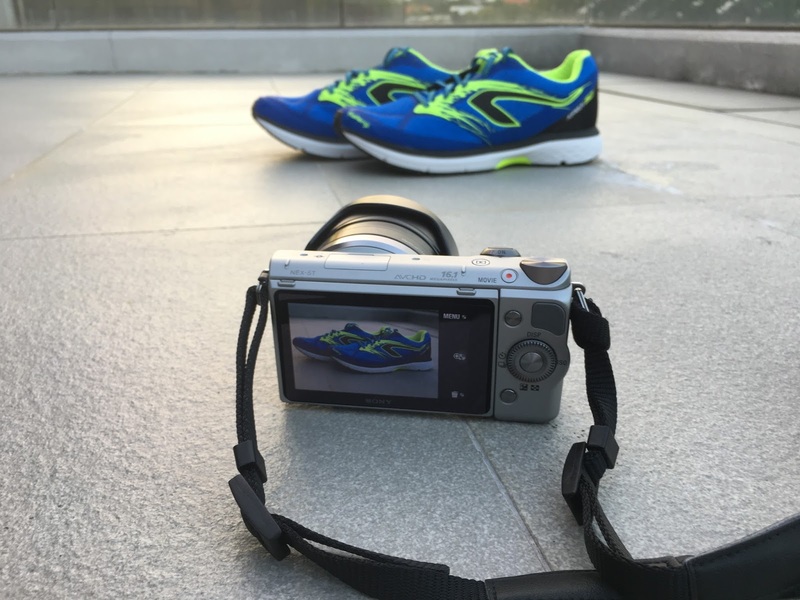 This review would not be complete without mentioning my race shoes! I contributed to a review of the Nike Zoom Fly here, and it was such a good shoe that despite weighing 80grams (50%) more than my usual marathon flat, the Lunaracer, I decided to go with it at the last minute. I think the biggest hurdle was mentally getting over the fact that the Zoom Fly was heavier than most of my training and long run shoes, and that I would have to lug all that weight around at race pace for nearly 3 hours. 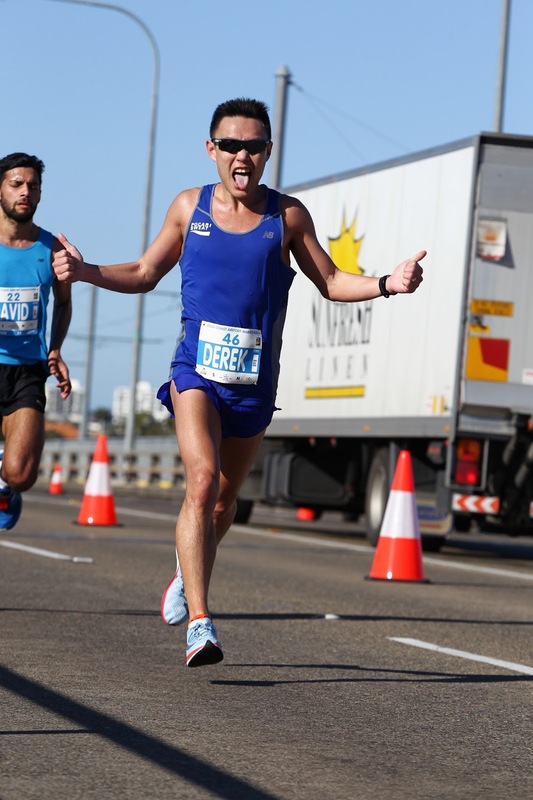 I did manage a 20k tempo at 4:00/km pace at ECP, and another 15k at 3:45/km on the track the following week, leading up to the race, and by then i was fairly comfortable with running at marathon pace/effort in the shoe without being overly concerned about the weight. Through some lucky connections that Lincoln at Coffee Tea Runners had, I was able to upgrade my race entry from a priority start bib to an Elite entry bib, which meant I was able to go to the elite entry waiting and recovery area both pre- and post-race. Both elite and priority start runners get to put their own bottles every 5km on the run course. For reference, i stuck to my usual strategy of taking in calories every 10km; only water in the bottles at 5/15/25/35km and got my calories mixed in water at 10/20/30km. Elite runners get to sit in a nice warm room before the start, and plenty of room next to the start to warm up, which was really cool. Having access to post-race shower facilities on site was just the icing on the cake! This was only my second ever race with an elite bib (see here for my review of the 2014 Macau marathon for my first experience), and sitting right next to Lee Troop and other elite athletes as they got ready for a race was still quite a nervous affair. The moments before the gun goes off are often filled with nervous energy, and I constantly reminded myself that the marathon is a long way to run, and it's best to settle in quickly. I positioned myself towards the rear of the elite race pen, expecting others to start off much faster, and hoped that I would have some runners to key off for the early miles. Before you know it, the gun goes and I make sure to pay attention to my breathing to keep things controlled. The first km was passed in ~3:30 and I immediately took steps to slow things down and let the pack go. It was around 12degC at the start of the race, and at that temperature, it usually takes a few kilometres for the fatigue of going too fast to kick in, so relying on GPS to moderate my efforts was always part of my plan. I was pretty isolated for the first 5km, stuck between the pack of faster priority runners who would eventually catch me, and the slower elite runners who were gradually pulling away. I passed the first 5km in about 18:31, which was a little fast but all the speed seemed to be from the first km so I felt content to just hold the pace. I tried to stay with some of the runners who caught me from behind though it was soon clear that a lot of them planned to run faster than 3:45 pace, at least for the start. Around the 7km mark, I was caught and passed by Gordon Lim, and I decided to try to hold his pace for as long as I could. He would eventually pull away from me and by the 21.1km mark, he was about 80m ahead of me as I passed the time check in 1:19:34. 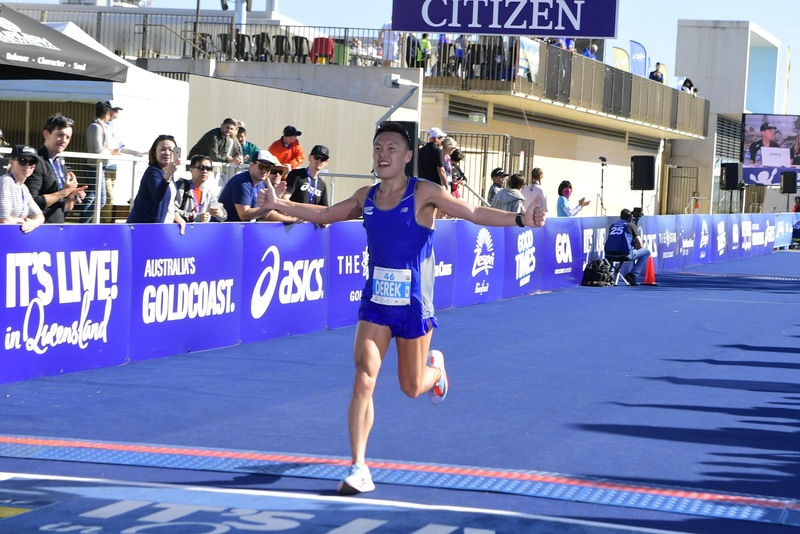 I ran the 10-20km stretch with a Japanese runner based in Australia called Sato, and another elite female runner. Sato was immensely popular with the crowd, as well as some of the slower runners we passed after the 16km U-turn. Lots of people were shouting encouragement to him, and I figured it would be good to run with him, to try to leach off a bit of that energy. His running vest said “Physio with a finish line” so I suspect he was working as a Physio in the Gold Coast. 20-25km was a bad patch for me, as I found myself breathing a little harder than I would have liked for that stage of the race. My heart rate had hovered around 166-169 for most of the first half , and was beginning to creep into 170. Having start monitoring my heart rate since the end of last year, and getting lots of useful info from the Dubai Marathon in Jan 2017, I knew what kind of HR I could sustain for a marathon, and I didn't want to go into the 170s so soon. I decided I would take the next 5km a little slower to try to get my heart rate to settle a bit, and as my pace dropped into the low 3:50s, I saw with relief as my heart rate settled into the mid 160s. After 25km, I started to feel better, and as luck would have it, Sato was still only 50-60m ahead of me. I was feeling good and skipped my water bottle at 25km (this bottle only had water anyway) and pushed on. While Sato slowed at his water station, I somehow managed to close the gap and overtook him. Sadly Gordon was so far ahead at this stage that he was completely out of sight and I had given up all hope of seeing him slow down. Around this time, another Australian runner in compression gear caught us and I ran with him for the next 5km. Somehow at the 26-27km mark I was starting to feel more confident and already anticipating the finish, thinking that it was only 40mins more of running after passing the hills at 31km. I wasn't going particularly fast between 25-30km and in fact it was still around 3:50/km pace, but I was running taller and really leaning into the stride more. 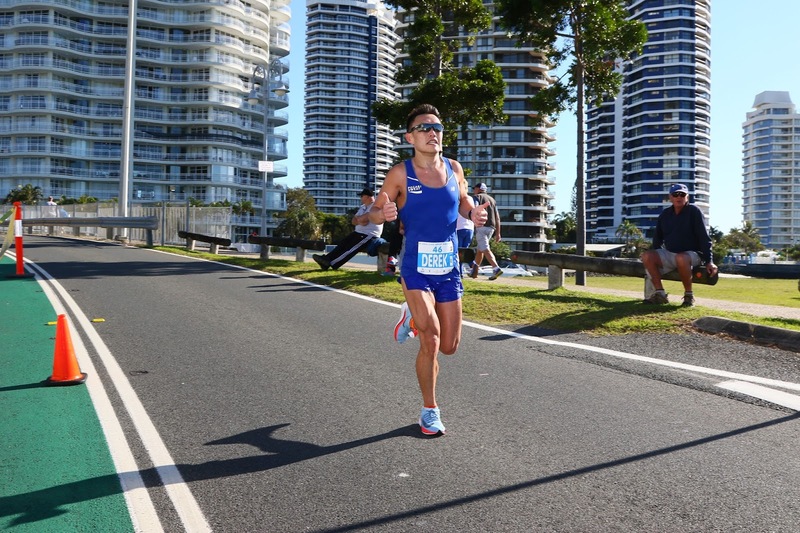 Unfortunately, Sato fell off the pace shortly after passing Surfers Paradise at around 26km (I think maybe Andy's cheers sapped his energy) so it was just compression guy and I. At around 29km, compression guy really picked it up and I let him go, but it turned out he really needed to go to the loo, and dashed for the port-a-potties just before the bridge. Once again I found myself isolated but that didn't last long. Another Aussie runner in a red singlet, and wearing Nike RN Distance shoes passed me and was running a very good pace, so I tried to go with him. We were flowing down the last hill at 31-32km and passed a struggling Lee Troop along the way; ageing is a remorseless uncompromising process. I managed to hang with RN distance guy until the 35km mark when I found myself slowing down. The sun was up in full force on a cloudless day and I was starting to really feel the heat at this stage. I managed to grab my bottle at 35km which also only contained water and sprayed half of it on my head and body, and drank the rest. The cold water managed to give me a bit of a boost at this point but it was short lived as RN Distance guy was slowly pulling away and I couldn't do anything about it. In the end he closed really strongly and his final time was 2:39:58 (net). The last 6km after the U-turn at 36km was all about damage control and I was running completely alone into a slight headwind. I did see a few familiar faces between 36-42km. First was Gordon! I was shocked to see him behind me but he looked tired and his stride wasn't quite as long and smooth as usual. Then there was Kin Fung, whom I was expecting to catch me at some stage but never quite materialized; he was still looking strong and probably would overtake Gordon soon. The 3-hour crowd soon followed and it was Romain Chanu maybe 20m ahead of Yew Wee, and I wondered then who would win that battle. (Both would go on to PB with Yew Wee clocking 3:00, and Romain doing 3:02. Let's see what the re-match at Boston yields) I knew that if I didn't fall apart completely I was going to PB, so it was all about putting one foot in front of the other and keep the legs turning over. This was the part where I knew I made the right decision to go with the Zoom Fly, as the higher stack of the shoe and the forefoot rocker really helped the turnover on tired legs. This result was bittersweet for me, as I felt I was ready for a sub 2:40 timing, but then again, to finally see a PB after 3 years of stagnation was certainly a step in the right direction. Life is going to change with a new kid on the way, and fitting running around new responsibilities is going to be much more challenging, but hopefully life will continue to keep me injury free and get a little more speed out of these legs before the inevitable slowdown begins. I'm finally able to race masters races now, and I hope to take part in some masters track races and even road races at next year's World Masters Athletics Champs in Malaga.